Thomas Paine recommended vouchers to help parents afford private schools for their children more than 200 years ago. While most college students today use vouchers to attend public or private colleges and universities, the concept remains needlessly controversial when it comes to parents using them for their school-age children. For example, in a recent Washington Post article Emma Brown recently claimed school choice hasn’t worked based on evidence from New York City, where students are no longer assigned to public high schools based on their zip codes. For starters, the Big Apple is hardly, as Brown calls it, “a real-life laboratory for questions of school choice” just because in 2004 the city deigned to allow parents of eighth-graders to choose up to 12 public high schools to attend out of a possible 400. Currently, more than half of all states have parental choice programs that include private schools – not just public schools. New York isn’t one of them. But Brown’s own evidence shows that empowering parents over their children’s education works. According to Brown, as of 2015 NYC’s overall public high school graduation rate has improved steadily and now exceeds 70 percent. Even neighborhood-based racial graduation rate gaps have diminished. Yet because they exist, school choice must be a failure. Brown seems to be implying (although she doesn’t say so explicitly) that returning to the old way of assigning students to schools would level the playing field. It likely would…but not in a positive way since assigned schooling minimizes the likelihood students will be able to attend schools that are the best for for them. And, by removing competition for students schools have little (if any) incentive to customize instruction to individual students’ needs. The reality is, parental choice programs are helping participating students (overwhelmingly those from disadvantaged backgrounds) as well as non-participating students who benefit from the effects of their schools having to compete for students and associated funding. A new research synthesis helps shed light on the growing body of research proving that parental choice works. Currently, there are 50 private school scholarship programs in 26 states and Washington, DC. What’s more, over half of them were implemented in the past five years. But do such programs work? 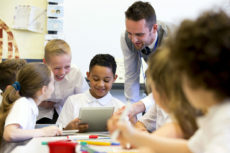 Experts from the University of Arkansas conducted a global review of “gold standard” studies, and using scientifically exacting methods concluded that private school choice results in statistically significant improvements in reading and math performance, 0.27 standard deviations and 0.15 standard deviations, respectively. To put those results into perspective, 25 percent of a standard deviation represents approximately one year of academic growth on most measures of student achievement. These results are all the more remarkable because most private school choice programs limit eligibility to students from low-income families, and these students typically struggle academically. Such results should come as welcome news for addressing chronic achievement gaps and high college remediation rates – but they likely won’t. Parental choice in education, private-school parental choice in particular, remains a political hot button. Teachers and administrators unions, among others, fiercely oppose supporting parents’ right to choose non-public schools for their children. Meanwhile, the Obama administration has done everything in its power to shut down the successful DC Opportunity Scholarship Program – (although it was recently reauthorized) in spite of evidence from the US Department of Education “What Works” division that the program is effective, efficient, and popular. It’s also accomplishes more for a whole lot less. Thankfully, parents and policymakers in the states are moving ahead with an ever-growing array of parental choice programs, including vouchers, tax-credit scholarships, and education savings accounts (ESAs). Such progress will be difficult if not impossible to stop, no matter how loudly critics complain.